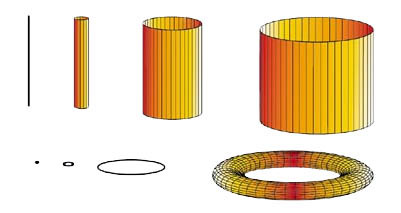 From a distance, a cylinder looks like a line, while a torus appears to be a point. The compacted dimension theory suggests that all the dimensions are present in our everyday world. However, these dimensions are so small that they are undetectable in our everyday experience. For example, imagine looking at a garden hose from a far away distance. From a distance, it seems to be a one-dimensional line, but upon closer inspection, we see it has thickness and a circumference. In this way, our daily macroscopic experience of physical phenomena tells us there are four dimensions (three spatial and one temporal), but theorists propose that inspection at the subatomic level would reveal the presence of extra dimensions. The Braneworld Theory suggests we are confined to 4 dimensions and cannot experience the other dimensions postulated by string theory. The braneworld theory suggests that extra dimensions exist all around us, but we are confined to a 3+1 dimensional subspace, and cannot experience these other dimensions. This is analogous to living on a sheet of paper as a two-dimensional figure. You would have no concept of depth - it is simply not a part of your physical world. 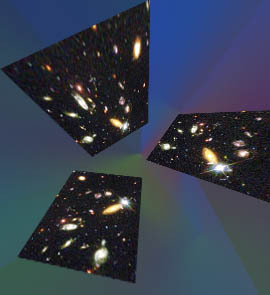 This is the concept behind braneworld theory, which says that our four dimensional spacetime is like the sheet of paper, simply a subspace of some bigger, multi-dimensional space that we cannot perceive because all matter and forces (except possibly gravity) we experience are constrained to this subspace, or brane (as in, membrane).